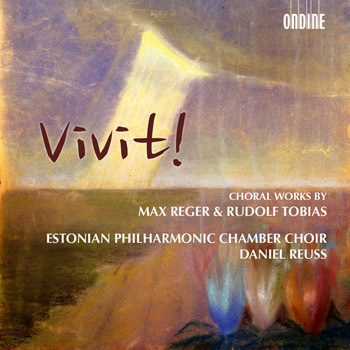 With this release the Estonian Philharmonic Chamber Choir under Daniel Reuss pay tribute to Max Reger (1873-1916) and Rudolf Tobias (1873-1918), a composer of the classical-romantic tradition and associated with the beginning of professional composition in Estonia. Reger connects the sacred and secular choral songs of this collection often with nature and its rhythm. Also Rudolf Tobias took up more secular topics for his sacred choral songs. Two of the most famous ones, "Eks teie tea" and "Otsekui hirv", are included on this release and invite to get more familiar with his music. The Estonian Philharmonic Chamber Choir is one of the finest choral ensembles and internationally praised for its stunning sound. Daniel Reuss is one of today's most acclaimed choral conductors. With his two ensembles, the Capella Amsterdam and the Estonian Philharmonic Chamber Choir, he is a frequent guest at international concert venues and has won many awards for their recordings. The first two releases of the EPCC and Daniel Reuss on Ondine have been highly praised by the critics and awarded with a Gramophone Editor's Choice, and several other accolades.